The Chinese Dragon Parade is customarily performed along with Lion Dancers, acrobats, kung fu performers, and of course, the drums and horns, all ending in a burst of firecrackers! 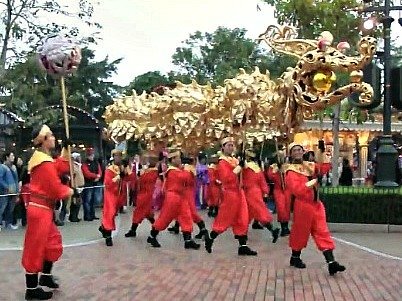 Above is a short clip of a Chinese New Year Dragon Dance at one of the many festivities in South Florida, click on the arrow to see the Dragon Dancers perform together with a team of Lion Dancers and drummers. The frame of the Dragon itself was traditionally made of wood or bamboo, covered with material. Nowadays, lighter materials are used, such as aluminum and plastics. 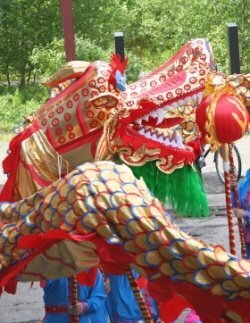 For the Chinese Dragon costume, different colors can be chosen. The main body of the serpent could be green, for a great harvest, or yellow, to represent the empire; golden and silver colors symbolize prosperity, and red denote the excitement and good fortune of the festivities. Dragons vary in length, some reaching up to 100 meters long! It is believed that the longer the Dragon is, the more luck it will bring! Sometimes the Dragon follows a man carrying a ball on a stick. This is the "Pearl of Wisdom". It is said that the Dragon chasing this "pearl of wisdom" represents the Dragon's way to pursue insight and knowledge. During Chinese New Year, sometimes it is a red or yellow globe, which is supposed to be the sun as the festival celebrates the spring rains and the sun for a good harvest. Click on the arrow above to see the Dragon chasing the "Pearl of Wisdom"! The Dragon Dance should not be confused with the Lion Dance. To learn about the Chinese Lion Dance click here.